War-Gods of the Deep is a delightful popcorn movie – not dreadfully deep, but eminently enjoyable. It deals with a trio (Tab Hunter, David Tomlinson, Susan Hart) staying at a manor on the Cornish coast in 1903, where the house is burgled by … mermen? Who later proceed to kidnap the woman, sending the two men — and a chicken — in pursuit, where they find a group of smugglers, living deep beneath the sea, near an active volcano, and led by the iconic Vincent Price. The smugglers believe that they can’t leave — they’ve been in their underground hideaway for 100 years without aging, and returning to the surface will cause them to age 100 years in moments. But, the active volcano is about to erupt … and to complicate things further, Vincent Price’s character thinks that the lovely young lady is his long-lost wife returned to him. 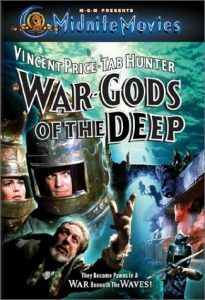 Directed by the great Jacques Tourneur (I Walked with a Zombie), War-Gods of the Deep is an eminently enjoyable movie, with good acting all around, some wonderful underwater aquatic cinematography, and some truly great sets that make the audience wonder who, exactly, built this undersea city … before it’s destroyed by the volcano. The Captain, Sir Hugh (Vincent Price – The Fly, House of Wax) – leader of the smugglers, who considers himself the king of the gill-men — and everyone else. Despite his villainy, including his willingness to murder any of his crew who disagree with him, he’s a tragic figure who actually feels responsibility for the gill-men … and unable to leave his underwater prison. Add to that his love for his long-lost wife, Beatrice, of whom Jill is the splitting image, and he’s a tragic figure. Harold Tufnell-Jones (David Tomlinson, Mary Poppins) – a painter, who along with his pet chicken Herbert supplies the comedy relief of the film — and who actually uses his wits to save the group on multiple occasions. Dan (Derek Newark, The Blue Max) – one of the smugglers, who tries to help the group escape, if they will take him with them; and pays for his betrayal with his life. Ben Harris (Tab Hunter): Up at sunrise to paint a sunset? Harold Tufnell-Jones (David Tomlinson): I’m a slow worker. Harold Tufnell-Jones (David Tomlinson): [to Herbert the chicken] There’s a lot to be said for ducks — water rolls off their backs, they can swim, even help a fellow out; unlike some chickens I know! The Captain (Vincent Price): Pathetic remnants of a great civilization. But, they are my people. The Captain (Vincent Price): I am their king … and more than their king. I am death. The Captain (Vincent Price): I must save my people. Ben Harris (Tab Hunter): How? The Captain (Vincent Price): Our stipend is fish. You know how many years it has been since I’ve had beef? Or chicken? Harold Tufnell-Jones (David Tomlinson): [moving away basket containing Herbert] Chicken? The Captain (Vincent Price): You’ll know the answer to that question if you live long enough. The Captain (Vincent Price): Can you save my city? Ben Harris (Tab Hunter): From the volcano? The Captain (Vincent Price): You have exactly 3 hours, Professor — make the most of your time. Ben Harris (Tab Hunter): Then she’s alive and she’s here! Where is she? The Captain (Vincent Price): You are alive, also — try to remain that way. Ben Harris (Tab Hunter): What do I know about volcanoes? Harold Tufnell-Jones (David Tomlinson): As much as the Captain — absolutely nothing. Ben Harris (Tab Hunter): I think you talk too much! Harold Tufnell-Jones (David Tomlinson): If I stop talking, we’re both dead. Ben Harris (Tab Hunter): The poem’s a coincidence. Harold Tufnell-Jones (David Tomlinson): And a gruesome one. Ben Harris (Tab Hunter): You mean we’re free? Dan (Derek Newark): As birds in a cage. Dan (Derek Newark): He owned the manor house, and all the land for miles around. But he was a smuggler all the same. Harold Tufnell-Jones (David Tomlinson): 1803? You must be mad! Dan (Derek Newark): Who wouldn’t be mad after 100 years of this. Ben Harris (Tab Hunter): You need our help? The world needs yours! You’ve found a way to live forever! The Captain (Vincent Price): It is a local phenomenon. The Captain (Vincent Price): [to Dan] You might have lived forever and ever. But perhaps you’re lucky. The Captain (Vincent Price): My men will guide you. Nothing will happen to you. Yet. The Captain (Vincent Price): Harm her? Why would I harm her? Rev. Jonathan Ives (John Le Mesurier): There’s some good in everybody, don’t you think? At least, that’s the precept on which I’ve built my life — my very long life. The Captain (Vincent Price): So you found the young lady. One of you is brighter than I thought. Harold Tufnell-Jones (David Tomlinson): That would be me! The Captain (Vincent Price): Then you must have your reward. The Captain (Vincent Price): They have been asking for a sacrifice for their volcano. Harold Tufnell-Jones (David Tomlinson): [pointing to Herbert] Him? The Captain (Vincent Price): You. The Captain (Vincent Price): We’re not murderers, sir. You will be given diving suits and a head start. Rev. Jonathan Ives (John Le Mesurier): [to the guard he knocked out] I’m truly sorry. Jill Tregillis (Susan Hart): [looking at a portrait] That’s me! jlm: Nonsense, that portrait’s over 100 years old. The tide won’t wait for you – now go! Harold Tufnell-Jones (David Tomlinson): [to Herbert the chicken, after a seaquake has caused the ceiling to collapse, separating them] Don’t just stand there, dig! The Captain (Vincent Price): Beatrice? Beatrice! Tell them that we’ve found each other! Make them help me so I can save you!